If it’s Wednesday…It must be What I Ate Wednesday! What is that you may ask? Well, no one who is familar with BCDC will wonder. It’s the wonderful, weekly to do put on by the lovely and clever Jenn at Peas & Crayons. When you’re finished here, please be sure to hop on over to P & C to look around read some blogs and please be sure to leave some comments. It’s what we all live for! 😉 Here we go! You’ve all heard me go on and on about how I’m staying on track regarding my Weight Watchers plan. I’ve been doing this for nearly 25 years…I shouldn’t have to think or talk so much about it. But I do. Why? Because it’s important to me. I’m sharing a whole day of my food choices. Not exciting perhaps, but all figured out and added into my food tracker to be sure I’m on track. Overnight oats in a jar (OOIAJ) in a real sunflower butter jar! 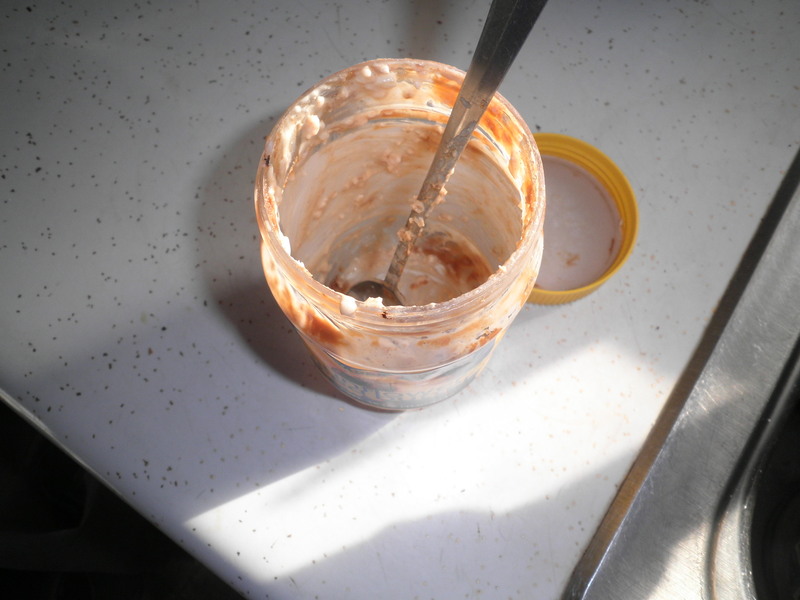 All gone… 😦 The really sad part is I have no more sunflower butter! It’s hard to find. I did find it at Target but it was Really expensive. Guess I do need to make a pilgrimage back to Trader Joe’s. Lunch was one of my favorites. I used some of the leftover salad from Sunday night’s visit to my sister Ele’s house. 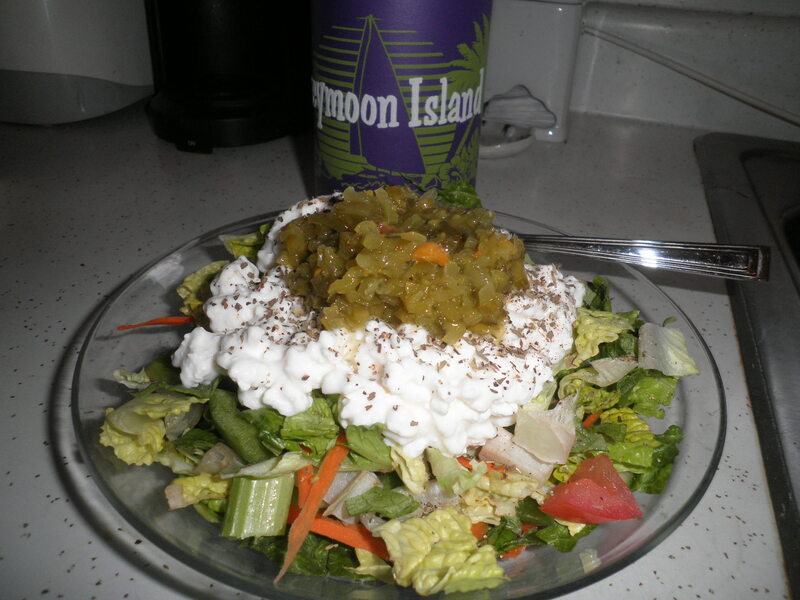 Topped with light cottage cheese, lots of ground black pepper, dried basil and sugar-free sweet pickle relish. This is so tasty and filling. I forget how much I love it until I make it again. Especially easy when you have already made salad. 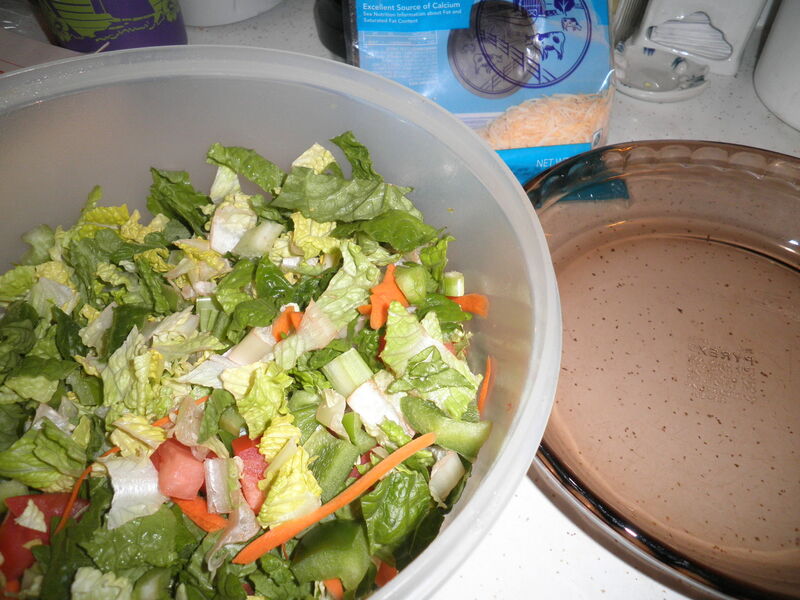 The completed salad with shredded cheese and light balsamic vinaigrette. Accompanied by a MorningStar Farms spicy black bean burger topped with shredded cheese on a sandwich round with Dijon mustard. Very tasty. Dessert was something different for me, but something I had come to enjoy during my 2 weeks in Florida. 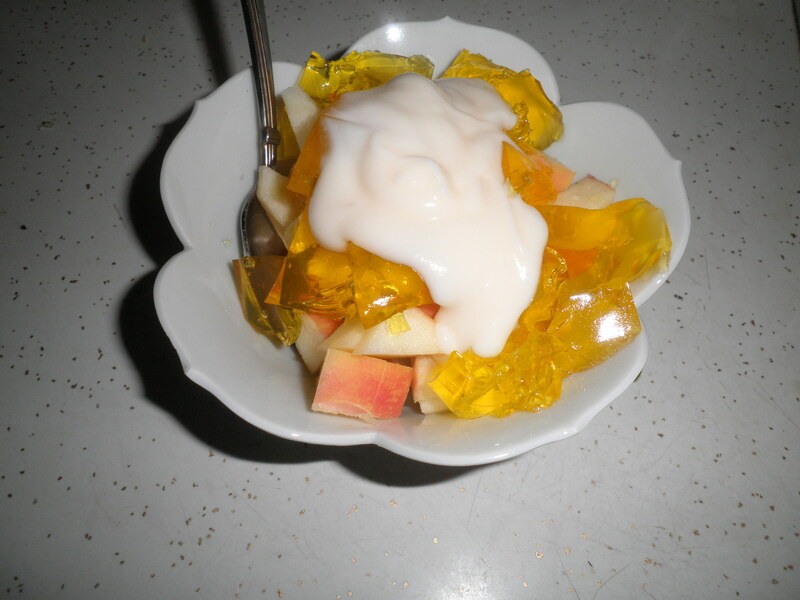 Chopped apple topped with lemon Jello and fat-free vanilla yogurt. It was really good and satisfying too. I didn’t have any other snacks. Remember to head on over to Peas & Crayons now to look around, wish you were where all the good food is and leave some comments. We love it when you do that! Happy What I Ate Wednesday! This entry was posted in Uncategorized and tagged BTMH, fruit, veggies, Weight Watchers, WIAW. Bookmark the permalink. Gram would be so proud of you with your cottage cheese and relish! I love that you eat your salad out of a pie plate! And I love the name of your blog – I strongly agree that broken cookies don’t count, ha! Hi Kelsey! I love the pie plate because things don’t escape over the side that way and I want every little morsel! 😉 Thanks for stopping by, please visit again! I wish I could make a pilgrimage to TJs, but that is exactly what it would be! I think the nearest one is 5 hours away. So hard to find things like sunflower butter here! Hi Laura! The closest TJ’s to me is about 15 miles, but it’s through an incredibly busy traffic and construction area. It usually takes close to an hour to get there. It’s worth it though. Thanks for visiting, please come back! “Am I good all the time? Of course, not. Do I always try? You bet. That’s all we can do is try” yes yes yes! I love you Fran! and your lunch looks so good I want to dive in and steal a few bites =) Have a lovely wednesday!! Thanks, Jenn! You’re such a sweetie and you help to make blogging so much more fun! Let’s keep trying, together! Hi Laura! I do love sun butter. Maybe I should consider ordering on line. Maybe I’d get a better price that way. Thanks for the idea! 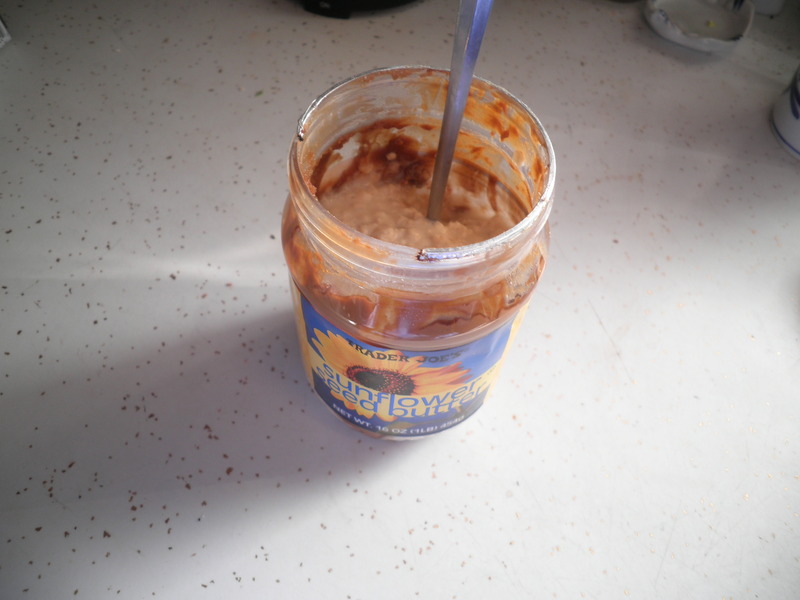 When I first tried Sunflower butter I wasn’t a fan. But I kept on eating it (didn’t want to waste a jar) and each time I liked it more. Now it’s my favorite! I just bought a crunchy version so I am excited to try it. Marie…Crunchy sun better?!?!? What brand, I need to try to find it! I like your snack/dessert idea! I’m definitely gonna try that out soon. I need to restock my sunflower seed butter too! It’s even far too long since I’ve had it! Hi Tara! I’ve had a hard time finding sunflower butter for a reasonable price. Need to ride up to Trader Joe’s I guess although I hate the drive. Lucky little Allie!! I shouldn’t complain…when we get to New Mexico, the closest one is 200 miles away! I’ll have to stock up before I leave! Hi Fran. 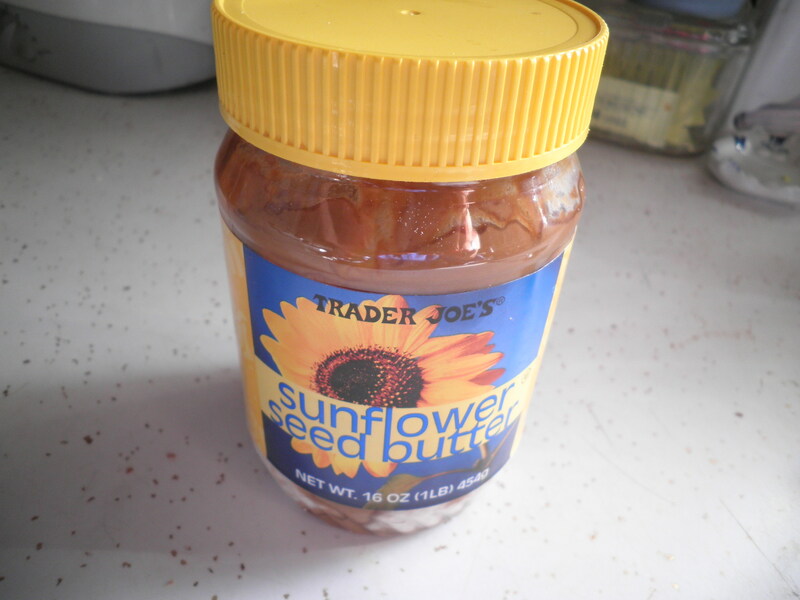 Note to me: Next time I go to Trader Joes, get sunflower seed butter! Hopping over to the other blog now…..have a GREAT Wednesday!!!! Hey, Roz…TJ’s has good prices and it’s got the sun butter! Guess I have to go soon! Thanks, Sarah! I love MorningStar Farms. Sadly, some of my favorites are hard to come buy. I’m considering seeing if I can order them directly from MSF! I didn’t know TJ’s would ship…I’m excited! Hi Tessa! I wasn’t sure about sunflower butter at first myself. Then I let myself taste the sunflowerseeds in it and i decided it was really good. Some things take time! 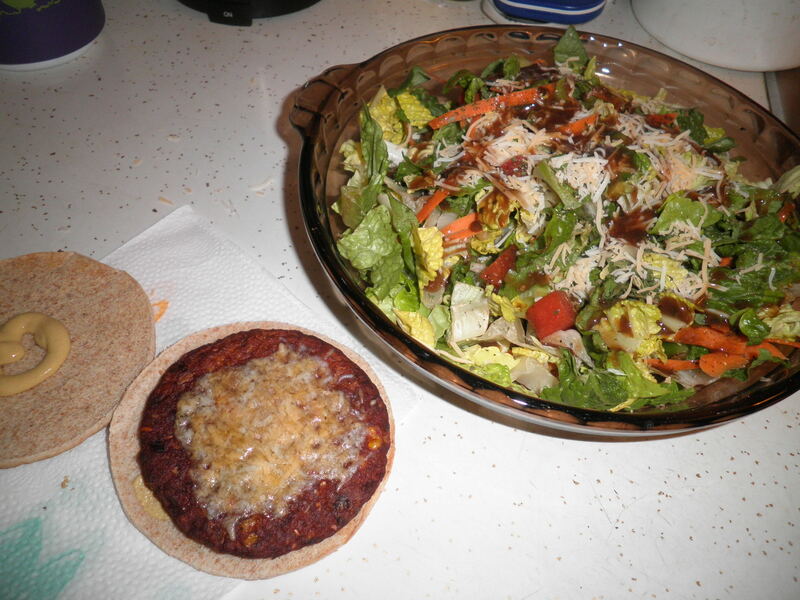 I love my veggie burgers! Thanks for visiting, please come back again! I love the look of sunbutter and still need to try it, the porridge looks great! Eleanor, I agree completely. However I gave up chips last year for Lent (potato chips, Dorito Chips, etc) and realized that I actually got back to the weight where I wanted to be. When Lent was over, I kept going and I have not had chips since. I’ve had so much less difficulty staying on track. It will be a year in March and I think it’s help me to keep my focus. Sounds crazy, but…we need to know our trigger foods. Hey, Zo, you’re right about Target having good prices. Walmart here is about the same price. Sadly neither carries a really good variety. They make chicken grill’rs that are delicous but we can’t find them her. Can you find them up in your area? Hi Marie. No sunflower butter is smooth like regular peanut butter. However another blogger I know recently mentioned finding chunky so I guess you’d just have to check the label. I can’t find it in a lot of places. Target has it but it’s much more expensive. Trader Joe’s has about the best price. Thanks so much for your kind words. You raise a good point about not having to be good all the time as long as you keep trying… I think that kind of mentality is what helps people stick to healthy eating in the long term. I have days where I’m on my “best behaviour” and others where I eat too much or eat unhealthy stuff. As long as you get back on track, you can definitely maintain a healthy weight without being perfect all the time. Hi and thanks for stopping by. It really is an on going process. I often get questions from people as to why I still follow Weight Watchers and why I still attend meetings because they say I look fine. Well the reason I look fine is because I do those things. I should make this the topic of a post. Thanks for the idea. Please come back to visit again!